Apart from the famous 24FPS International Animation Awards, MAAC hosts several other events. Here, students get an opportunity to showcase their skills & to interact with experienced animation, VFX, gaming, and media & entertainment professionals. MAAC is a popular name in the film and animation industry. MAAC hosts several small and large scale events round the year. The events serve as grand platforms for students to showcase their works, interact with experts from news, VFX, film, and animation industry, and to sharpen their knowledge about the industry. The events are organised in different parts of India. These events also serve as platforms for students to receive awards and accolades for their works like animated films, videos, and advertisements. Here are some of the MAAC events that happen round the year. MAAC'S 24FPS 2014 International Animation Awards a grand success! Celebrating the creative talents of MAAC students & animation industry professionals from across the world, the 24FPS International Animation festival & awards ceremony took place on Friday, November 28, 2014 at The Lalit Hotel in Mumbai. The daylong festival was open to all, and featured several talent contests and games such as Drop the coin & Minute to win it. The highlights of the day were the National Finals of MAAC Got Talent & the live Gaming competition. Autodesk & Wacom put up kiosks to acquaint visitors with their new lines of products & offerings for creative professionals. This year, the presence of filmmaker Anurag Basu came as a huge surprise for MAAC students. The director of top-rated films such as Barfi, Life in a Metro, Murder, Gangster, and more, graced the festival. He judged the MAAC Got Talent contest & also addressed the adoring students who lined up to click pictures & selfies with him. In the evening, senior animation & VFX industry professionals made their presence felt at the glittering Awards night. The Awards celebrate outstanding achievement in the fields of animation, VFX, multimedia, photography, and lighting, along with recognising ground-breaking work by Indian studios & industry professionals. Apart from the buzz & excitement of winning these coveted Awards, the evening program featured live performances by artistes such as MJ5 (of India Dancing Superstar fame), liquid drummer Vikalp pulsating performance with a mix of beats & liquid lights, and Sahil Shah hilarious stand-up comedy routine which left the audience in splits. 2014 marks the 11th year of the 24FPS Awards. Since inception, these much-awaited Awards have given students a huge platform to showcase their talent & earn recognition for their work. With every passing year, the quality of entries soars to new heights. This year, the Awards witnessed participation from an overwhelming number of students from different MAAC centres in India. Each entry was judged by industry veterans consisting of the who s who in media & entertainment. All in all, the 24FPS Awards were about creativity, power-packed talent, magnificent performances, entertaining acts a complete package. Three cheers for Team MAAC & for our wonderful students! Tenth MAAC 24 FPS finishes off in a grand style! It was a special occasion for MAAC, being the tenth 24 FPS animation awards night, hosted at The LaLit in Mumbai on Friday, December 6, 2013. 24 FPS awards honours excellence and recognize animation talent across the globe and rewards young artists and MAAC students for their creativity. The award is an initiative to promote the work done by young animation film makers and give them a boost in the industry. Awards were given out across categories like Best VFX Short Film, Best 2D Animated Short Film, Best Game Design and others. The jury panel comprised of industry stalwarts like Dreamworks, Rhythm & Hues, Pixion, JWT, Prime Focus and others. Apart from the main attraction - awards - the audience was enthralled by two unique performances - Sumont and Sonali from Bad Salsa of India's Got Talent fame and a comedy extravaganza by Suresh Menon, which kept the audience in splits. The tenth edition of the 24FPS International Animation Awards festival successfully engaged MAAC students in some unique activities like trendy gadget and technology display, caricature painting, Tarot reading, graphology, and face painting. The highlight of morning fest was the national level talent hunt competitions like Dance MAAC Dance, MAAC Got Talent, MAAC Idol, COD (Gaming), and NFS (Gaming), where shortlisted MAAC students from all over India competed to win the coveted titles in their respective categories. The success of the awards and the festival was visible through the sheer number of student and industry people present at the event. Kudos to the MAAC team for such a brilliant show! Experimental Animation-Studio - INDIA Beam Fiber Studio Eeksaurus Productions Pvt Ltd.
24 FPS 2013 gets bigger and better! MAAC's 24 FPS is back with a bang in its tenth year. And this year, it is going to be ten times bigger! 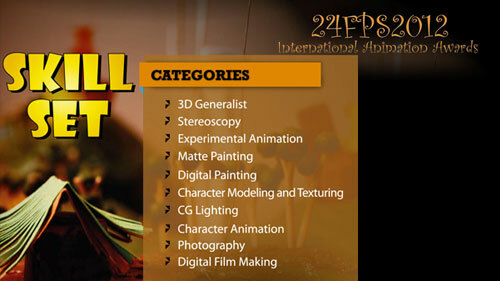 24 FPS 2013 will host some exciting competitions and fun elements throughout the day, followed by much-awaited Animation Awards Nite. Offering the best in entertainment and hands-on fun, 24FPS has something for everyone! There are performances by a rock band and a dance troupe, a chat show that parodies Koffee with... (You know who), and stalls for tarot reading, graphology, tattoo, nail art and face painting. Be there and don't miss the action! Entries open for all. A day full of entertainment, performances, animation video screening, the grand awards nite & other surprises! MAAC's ninth 24FPS International Animation Awards concluded successfully and was a roaring success. 24FPS 2012 was organized by MAAC in association with UNIC on December 7, 2012, at The Lalit Intercontinental in Mumbai. This year the awards surpassed all expectations with a magnificent participation from students and studios across India for different award categories. This one-day festival had interactive sessions with industry experts, exhibitions and entertaining competitions such as, MAAC Got Talent, B-Boying, Paint Yourself workshops and many more. All winners were awarded certificates and exciting prizes on the spot. Kudos to the MAAC team for putting up a wonderful show! MAAC Manifest 2012, an educational seminar conducted on October 29, 2012, was conducted by MAAC at Pune to educate students about progressive career options in animation. This event also provided a platform for interactions with industry experts. Arnab Chaudhuri (Creative Director) and Arpan Gaglani (Technical Director) of Delhi Safari fame took the students behind the curtains. Making of the movie and a few glimpses of the movie were showcased. More than 800 students participated in this event, making it a grand success. Kudos to the MAAC team! Game lovers! Here's an opportunity to participate in an exciting gaming tournament. If you are a MAAC student, compete at the national level at the 24FPS International Awards in Mumbai. Winner takes home prizes worth Rs. 100,000 and much more! 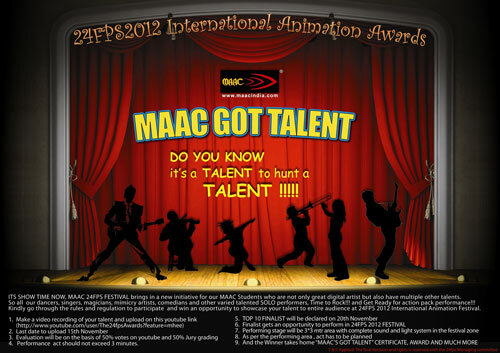 An initiative for MAAC students who are not only great digital artists but also have multiple other talents. So all our dancers, singers, magicians, mimicry artists, comedians and other varied talented solo performers, get ready for an action-packed performance! A never done before treat for MAAC students! Held every year, the 24FPS International Animation Awards are a unique platform for film-making using the medium of 3D Animation, Live Action and Visual Effects (VFX). The Awards promote animation talent from across India & around the world. Initiated by MAAC in 2003, this event has grown to become one of the most prestigious Awards in the industry. 24FPS offers a chance to students & studio professionals to showcase their talent. Youngsters get an opportunity to have their work viewed & assessed by world-class experts working with top studios. Thus, students get to understand what the industry demands. Over the years, films, ads & other work screened at 24FPS has gained world-wide recognition on various platforms. MAAC & United Nations Information Centre announce the theme of 24FPS International Awards 2012: FUTURE WE WANT. Hosted on 9th December,2011 at The Leela, Mumbai, MAAC 24FPS received a great response with over 1100 entries from China, U.S.A, U.K., France, Germany, Pakistan etc & a 5000+ audience made up of students, professionals & animation enthusiasts. The 'Next in Bollywood' events are open to everyone interested in the Animation, VFX, Gaming and Media & Entertainment industry in India. The events highlight the change in approach & quality that Indian studios have achieved over the past few years and the methods by which they are making their mark through national & international projects. 'Next in Bollywood' showcase the current trends in Animation & VFX. The event features leading animators discussing techniques & software used in national & international projects today. 'Legends of MAAC' is a series of seminars conducted by alumni/ ex-students of MAAC who have grown in their careers to become industry experts. These alumni are now working with top animation studios in India & overseas. The 'Legends of MAAC' seminars help everyone who aspires to make it big in Animation, VFX & Gaming by providing complete knowledge about the industry. The events feature discussions led by MAAC alumni who showcase their experiences & industry insights to guide students & help prepare them to take on challenging job roles within the industry. During the Edufair, industry professionals showcase animation projects and conduct live contests, workshops, seminars & case studies. They also mentor & guide students on various industry trends & software/ technologies currently in use. Almost 172 students were successfully interviewed during this Job Magnet.